Elevate your eating experience to a whole new level by incorporating your sixth sense at least once per week. This sixth sense is not your intuition, but your sense of adventure! Try a new food item, cultural dish or restaurant that has piqued your interest. This may involve a strange fruit or vegetable you saw at the produce market, some enticing aroma wafting from an outdoor grill, or sights and sounds of sizzling foods delivered to a table. Eating is one of the most wonder-filled (and wonderful!) experiences in life. Embrace a beginners mind every time you sit down to eat. Indulge in a variety of foods and delight your taste buds and your 6 senses with surprising concoctions like kabuli dream, stone bowl bibimbap, or koshari. Have I piqued your interest? I hope so! Now it’s your turn! 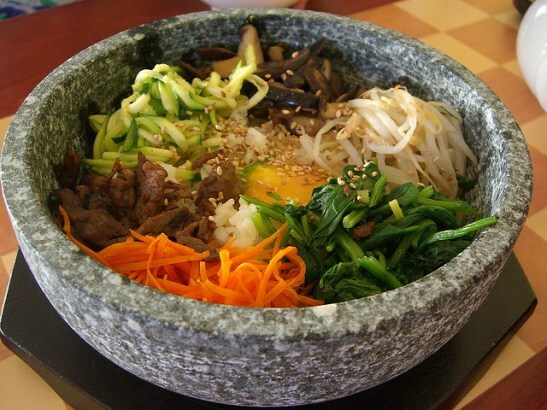 Would you like to sample some of my bibimbap? (pronounced Bih-bim-bawp). Say that 10 times and then set a day to treat yourself!